Drywall is a modern building material that comes in large panels (typically 4' by 8') having a gypsum core sandwiched between two heavy paper faces. These paper faces are often made from recycled paper. One face is smooth and is the surfacing face, and the other is more of a kraft paper backing face. It replaced older and more labor intensive interior finishing processes involving plaster and lath. Drywall came into popularity after WWII as faster and less expensive methods of home building were being developed. 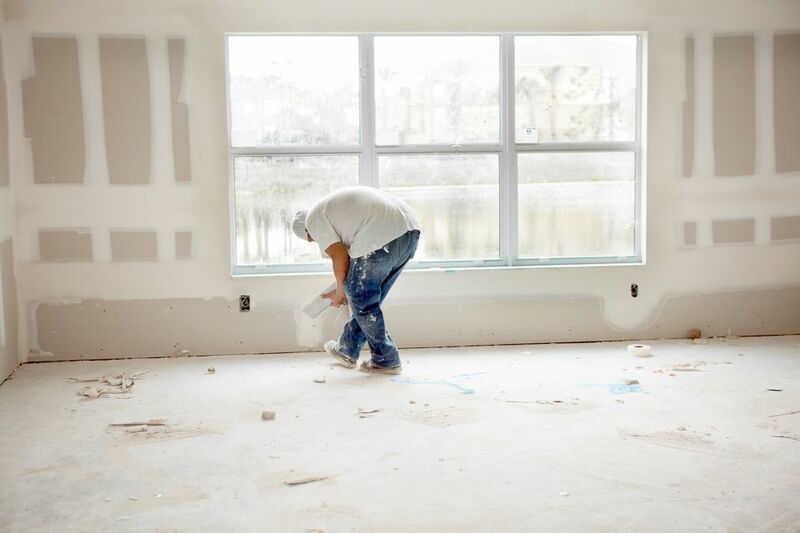 Drywall is now the de-facto standard of interior wall surfacing used in new home construction and existing home repair and renovation. What's great about this product is that it is inexpensive, easy to work with, can be used in a variety of applications and can be used even if your home has plaster walls. It readily accepts a wide range of interior paints and finishes. Drywall is easily cut with just a sharp knife and once taped and sanded, it allows painting and finishing almost immediately. Additionally, drywall is non-combustible. Drywall's recycled face paper is folded around the long edges of the panel to reinforce and protect the core. The short edges of the panel ends are square-cut and smooth. The special shaping comes in the long panel edges. The long panel edges of panels are tapered which allows joints to be reinforced with a special tape and then concealed with a special drywall finishing compound. Once the joints are "taped and finished" a well-done installation will have virtually invisible panel joints. For most residential applications drywall will be used on the walls and ceilings. However, drywall comes in many different types, thicknesses and sheet sizes depending on its application. Let's review the types of drywall you may find in your home improvement center or lumber yard and how they are used. Drywall thicknesses include 1/4", 3/8", 1/2" (typical), 5/8", and panel lengths range from 8 feet to 10 feet and can go as long as 16 feet. Panel widths are usually 48" and the most common panel size you will find is a 4'x8' panel in a 1/2" thickness. 1/4" and 3/8" Thick Panel: Recommended application is for residential repair/renovation and is typically used in a single or double layer application when covering a curved surface with a small radius. One common use of these thin and relatively lightweight panels is to go over the top of severely cracked old plaster ceilings to get a nice smooth surface. 1/2" Thick Panel: Most common types used in residential construction. Recommended application is for single-layer applications over studs spaced 16" on center. Most doors frames and window frames are designed for use with 1/2" drywall thickness. 5/8" Thick Panel: Recommended application is for residential single-layer applications over studs spaced 24" on center or where more sound control or a one-hour fire rated wall is required such as between the garage and the house. To achieve the one-hour rating use a Type "X" 5/8 wallboard. Type "X" drywall usually has perlite, vermiculite or boric acid added for added fire resistance. Water Resistant: Special water and mold resistant drywall is used in wet applications such as in bathrooms and usually has a green paper face. What Is Greenboard Drywall and How Is It Used?